The Fête de la Science 2017 has started ! For the occasion, the Laboratoire d’Annecy de Physique des Particules organise a unique conference on Saturday 14 and Sunday 15 October. During one hour, the visitors of all ages will travel in a world of questions and answers. They will work together to sort the truth out from the lies. First, a short 20-minute conference will explain to the public the keys of the scientific approach and its applications in the everyday life. 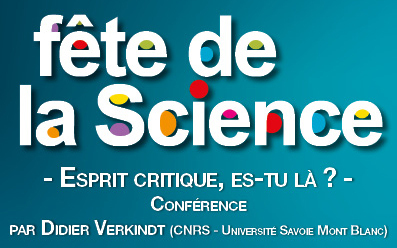 The conference will rely on zététique notions from the courses of Henri Broch (University of Nice). Then, the public will play a greater part in the conference. During a game, they will have to think critically to sort out true statements from false ones. The conference Esprit critique, es-tu là ?, given by Didier Verkindt will take place on Saturday 14 and Sunday 15 October, from 5 to 6 p.m. in the Auditorium of LAPP. It will be free and open to everyone.